This thread should probably include all 4 of the books in the series. I have finished reading Little Women, the first in this series and am half way throught the seconds, Good Wives. Here is a synopsis from amazon. Meg, Jo, Amy and Beth - are four "little women", enduring hardships and enjoying adventures in Civil War New England. The charming story of the March sisters, "Little Women" has been adored by generations. Readers have rooted for Laurie in his pursuit of Jo's hand, cried over little Beth's death, and dreamed of traveling through Europe with old Aunt March and Amy. Future writers have found inspiration in Jo's devotion to her writing. 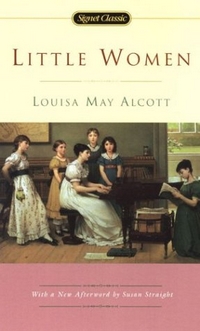 In this simple, enthralling tale, both parts of which are included here, Louisa May Alcott has created four of American literature's most beloved women. This is a really good story and it's quite easy to read. I don't read classics too often but have thoroughly enjoyed what I have read of this series.